IN SERVICE OF THE ANTICHRIST! FAITHFUL sons of the Holy Orthodox Church - get up! The Church is in danger! The bugle is calling for battle! Kallinikos Sarandopulos for many years was deceiving us that he is orthodox and played the role of a “zealot of Orthodoxy”. And in reality has always been a wolf dressed in sheep’s clothing (Mat.7:15)! A typical example of such a wolf. And here now the truth about the satanic role of Kallinikos is fully revealed! – A SHOCKING DOCUMENT is signed – SUPERMEMORANDUM of the antichrist – From this satanic document it becomes clear what is pursued – convocation of a so called “8-th ecumenical” council of the antichrist with the purpose: destruction of the Orthodox Church and converting the people into cattle. See this document! – it clearly reveals the satanic role of Sarandopulos and testifies WHY he made the UNIA with the kyprianites. He made it by order of the pope and the masons who are preparing the coming of the antichrist. He made it in service of the antichrist! For so many years he was deceiving us that he is "orthodox" – and now Sarandopulos proved that he is their agent, planted into the Church to destroy it from within >>> ΑρχιΚΑΤΑσκοπος! = Arch-spy of the antichrist! - And when Kallinikos Sarandopulos signed the UNIA with the kyprianites – and you will uncover the truth with your own eyes, without needing someone else to interpret it for you. You will also uncover the truth WHY at that same time, also Chrysostomos Manyotis made a trip to the archheretic Bartholomew in Constantinople, or as specified in the SUPERMEMORANDUM – in “Istanbul” in connection with the “outside Istanbul” orthodox christian churches. All this – with one purpose: the so called “8-th ecumenical” council of the antichrist! On 18/30 December 1969, Metropolitan Philaret, the new Hierarch of the Russian Orthodox Church Outside of Russia together with his Synod officially recognized the canonicity of the ordinations of Acacius (Papas) and the other Bishops, which finally removed all doubts about the canonicity of the Synod of Archbishop Auxentius. St. Metropolitan Philaret wrote to Archbishop Auxentius that ROCOR regards the hierarchy of the Synod as brothers in Christ in full liturgical communion. Under this anathema fall the heretics Cyprianites, who teach exactly that the sacraments of heretics are effectual for salvation. In 2014 the heretics Cyprianites created a new Cyprianite Synod whose "archbishop" became Kallinikos Sarandopulos. - and which action is of men? Is it possible for the people to "cancel" the damnation???! WHEN and WHY I Did I Leave Their Synod? Why it is a lie that supposedly I Father John (Vasilevski) belong to their heretical Synod-K? What high self-esteem on their part! And what an insult to me - that I supposedly belong to their heresy! and just two cases of each of them! - Is it possible for this pouring done in the Synod-K to be Orthodox baptism? 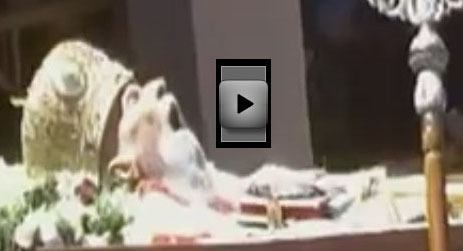 1) This papal pouring is not an isolated case! This is the way the papal "baptism" has been done here always and in every case – in front of witnesses for more than 10 years to the very date of this publication = the video conversation with the witness! 2) Bishop Kallinikos was notified repeatedly BY WITNESSES of these incessant cases of papal pouring at Manyotis’ – even before he became archbishop! B. Second case of papal "mystery". The papal "mysteries" in the Synod-K have not stopped but continue to this day! 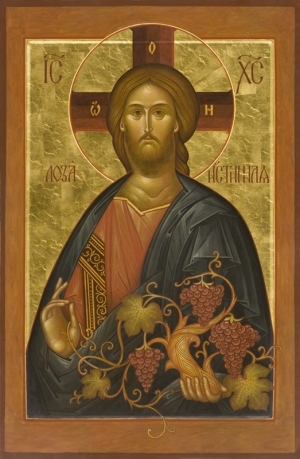 On Sunday, July 13, 2014, in the church of the Brookwood Monastery in England, Aquilina was performed the "mystery" of "Marriage" to wit - "wedding" - between a papist and an "orthodox" woman from the Synod of the heretics cyprianites (Synod-K). This "wedding" was performed by "priest" Gregory Lauani, who is a "spiritual" son of Photius Mandalis and fanatically requires from the laity-cyprianites to perform blind obedience to Mandalis and the rest of their "bishops". Continuously and in all possible ways he stresses upon this requirement of blind obedience. Photius Mandalis uses the following justification: "When we learned that the wedding was appointed for that date, it was too late and there was nothing we could do." "we will NEVER do it again! Solid promise!" - says that this "wedding" is not valid! None of them says that there took place no Sacrament of Marriage! - none of them says that he will not be given communion along with his wife. - none of them says - what future fate they have invented for this man! Have they thought at all that he is a man - and what fate they have prepared for him with such frivolity of theirs? Do they think at all: What will they do with him after this "wedding"? will they baptize him? – will they give him chrismation? The heretics cyprianites of Bulgaria only give chrismation to papists - because supposedly these heretics have grace, "tied grace" - according to the teachings of Seraphima Lieven and Sergius Yazadzhiev, cyprianites-"theologians" of Bulgaria. For many years, I was explaining them that it is impossible "the Grace to be tied," that is blasphemous that they say so, but the Truth is on the contrary: the Grace is that ties - because the Grace of The Holy Spirit, as taught St.Gregory Palamas, is The Holy Spirit Himself! But they were stubborn fanatics and never wanted to understand this Truth of the Orthodoxy. Thus they died in that blasphemy against the Holy Spirit. A heretic cyprianite "priest", a Serb, of the monastery of Kallinikos says that all who believe the cyprianite heresy and these apostasies are large and for that reason are leaving the Synod-K, needed psychiatric treatment! – according to him these were "small", "minor" apostasies and even were not apostasies at all because they had good reason. This is the same demon that drove the cyprianites already since 1992 - to say that he who had gone to the Synod of Chrysostom – needed psychiatric treatment. - only give him a charming smile. Just so they accept their brethren heretics from the ecumenical Moscow Patriarchate – only with a charming smile! Ask Chrysostomos Manyotis - from tens of thousands who came from the Moscow Patriarchate into his diocese - is there at least one whom he has accepted otherwise than – only with a charming smile? Is there at least one of the tens of thousands whom he has accepted with chrismation?!! Not one! 1. The Holy Orthodox Church accepts the papists and the poured over ecumenists from the MP - with Holy Baptism. 2. The Bulgarian heretics cyprianites accept the papists and the poured over ecumenists from the MP – with chrismation (because supposedly they have grace). 3. And the Greek heretics cyprianites (Synod-K) accept the papists and their own brothers ecumenists from the MP – only with a charming smile! B. Second case. See how they persecute the Orthodox Priest Father Haralambos Serb – they sent him a letter to judge him immediately on the third day after he refused to kiss the hand of "archbishop" Kallinikos for the latter had fallen into the heresy of cyprianism – and because he humbly asked Kallinikos a single question to which Kallinikos could not answer and flew into a rage. - the assemblage persecutes only Orthodox Priests, and laymen - even when they do not belong to them! 2) Is it possible that a Priest knows about all these FACTS of apostasy (2Thes.2:3), but stays in this Synod - and at that has Orthodox conscience? 3) Is it possible if this Priest leaves them because of these FACTS of apostasy – that the heretics of Synod-K would have authority and right to judge him? ANATHEMA on the Pope and The Papists! - Why Synod-K (and in particular the persons - Chrysostomos Manyotis and Photios Mandalis and others of their group in the Synod) persecutes True Orthodox Priests - both in Greece and in Romania and elsewhere and plays a circus that supposedly has power to "depose" them if they separate themselves from their heretical kyprianite Synod-K or if they do not join their heresy? - Why Synod-K (and in particular Manyotis and Mandalis and others in this group) persecutes True Orthodox Christians - and threatens them with curses - thereby blackmailing them and trampling on their human rights of choice – blackmailing them to accept exactly their pseudo-mysteries - and not the Sacraments of a Priest whom the laity choose themselves? - BY WHOM is Synod-K supported that so without fear it tramples the laws of the European Union for human rights and free religious choice? - Why in Synod-K are performed intermarriages between their "Orthodox" and the Moscow Patriarchate and even the Papal heresy and is performed papal "baptism" with pouring for more than 10 years? "What business had Chr. Manyotis in the office of the heretic Christodoulos, a papal agent from the papal organization "Pro Oriente" designed to implant papal spies in the Orthodox Church? " "What business had Chr. Manyotis in the office of the heretic Bartholomew, a papal agent from the papal organization "Pro Oriente" designed to implant papal spies in the Orthodox Church?" into the most sought-after Priests in the World! have NEVER been persecuted for faith! - PERSECUTORS of the Orthodox! do not belong to them! Chrysostom, Kallinikos and the others with them HAVE NEVER BEEN PERSECUTED for faith. They dreamed to find and tell us a case in which they were supposedly persecuted for faith, in order to show off to us, the Serbs Russians Romanians Bulgarians (who survived the persecutions of bolshevism) - that supposedly "they are heroes, too". But the examples these "heroes" would show and thump their chests, would make us laugh: his mother was told to get off the bus, because she was "by the old calendar"
and other suchlike "persecutions"... ahhh! "Cruel persecutions"! And here the time came and they themselves exposed their lies and now showed their true faces: persecutors of the Orthodox! would NEVER persecute another man for faith! A. First case. See how a "priest" of the Synod-K ordained by "bishop" Photius of Marathon for almost a whole year is serving "liturgy" by the papal calendar and not only do the Synod-K not call him to court, but have not given him even a reproof! See "liturgy" of Assumption 2/15 August 2014 by the papal calendar. B. Second case. 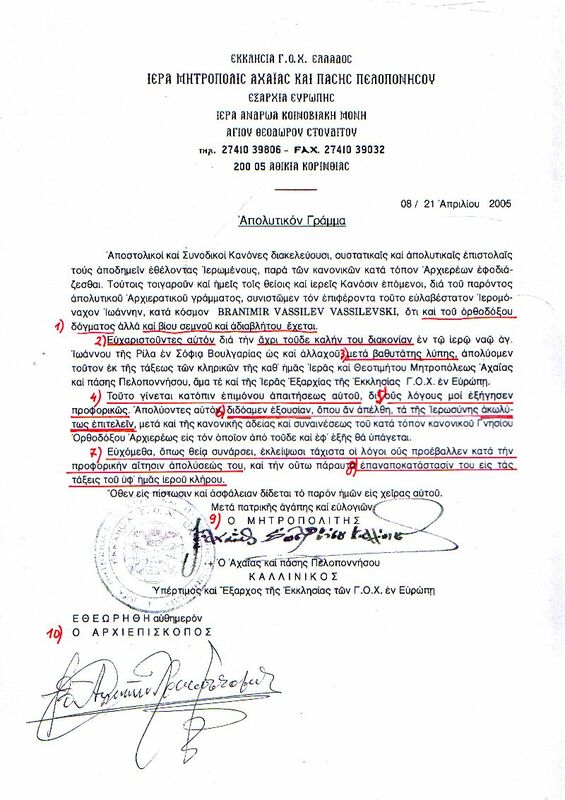 See how they persecute the Orthodox Priest Father Haralambos Serb – they sent him a letter to appear before their court immediately on the third day after he refused to kiss the hand of "archbishop" Kallinikos for the fact that he fell into the heresy of cyprianism – and because he asked Kallinikos a single question to which Kallinikos could not answer and flew into a rage. After the fall of Kallinikos Sarandopulos in the heresy of kyprianism, the heretics matthewites get up to circus tricks (devilish resourcefulness), to seduce and lure the few remaining True Orthodox Christians in the heresy of matthewism.